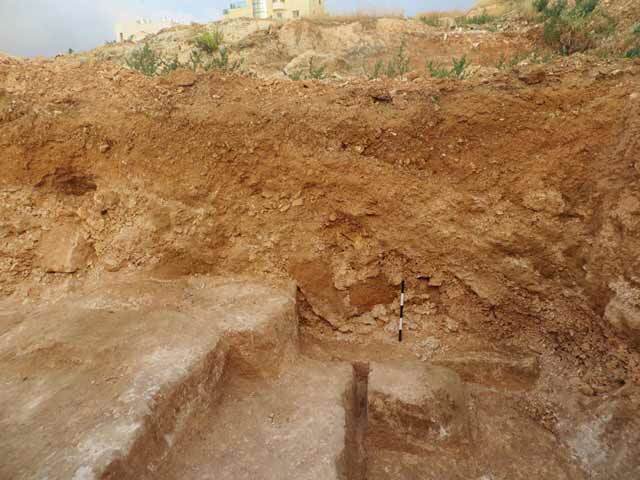 In May 2016, a salvage excavation was conducted at Shikune Nusseiba in the Beit Hanina neighborhood of Jerusalem (Permit No. A-7712; map ref. 221099–275/637573–636), prior to development work. 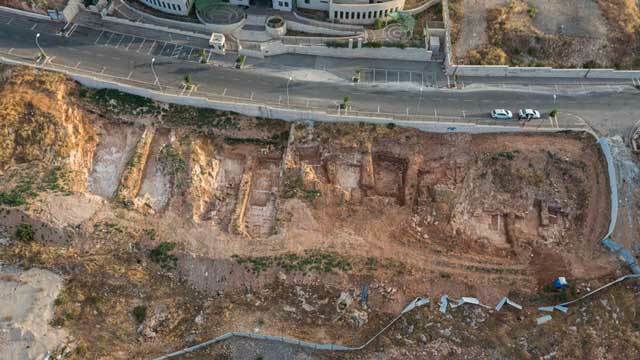 This excavation, undertaken on behalf of the Israel Antiquities Authority and financed by Mr. N. Abu Lil, was directed by D. Yeger (area preparation and field photography), with the assistance of N. Nehama (administration), A. Hajian and Y. Shmidov (surveying and drafting), the Griffin Company (aerial photography), C. Amit (studio photography), Z. Matskevich (antiquities inspection), O. Ackerman (geomorphology) and B. Touri (East Jerusalem district archaeologist). 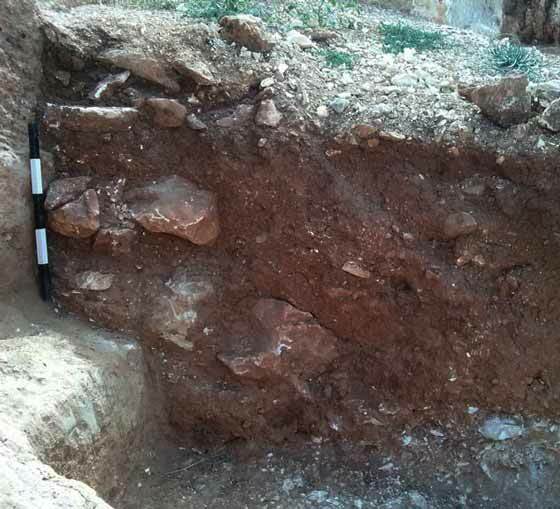 The excavation was carried out in a lot on Halil es-Sakakini Street, on the southern slope of a hill, north of ‘Abd el-Hamid Shuman Street (Road 4197). The hill is bounded on the east and north by el-Zaytuna Street and on the west by Highway 50. 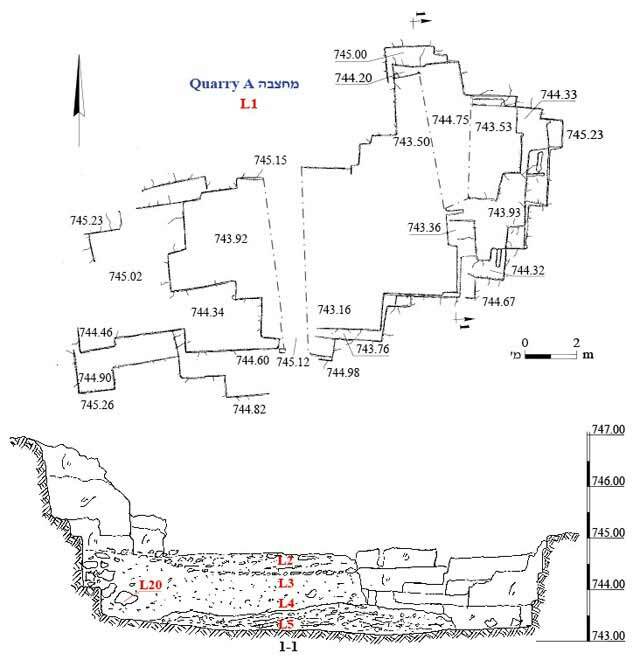 A series of quarries from the Roman and Byzantine periods stretches across the Shuʽafat – Beit Hanina ridge, many of which have been surveyed and excavated in the past (ʽAdawi 2007 [Fig. 1:1]; Mizrachi 2008a [Fig. 1:2]; Mizrachi 2008b [Fig. 1:3]; ‘Adawi 2009 [Fig. 1:4]; Zilberbod 2012a [Fig. 1:5]; Zilberbod 2012b [Fig. 1:6]; ʽAdawi 2012 [Fig. 1:7]; Zilberbod 2013 [Fig. 1:8]; Yeger 2014a [Fig. 1:9]; Yeger 2014b [Fig. 1:10]; ʽAdawi 2014 [Fig. 1:11]; Yeger 2015a [Fig. 1:12]; Yeger 2015b [Fig. 1:13]; Billig 2016 [Fig. 1:14]; Yeger 2016 [Fig. 1:15]; Zilberbod 2017 [Fig. 1:16]; Fig. 1). Two ancient routes leading to Jerusalem passed along the ridge: the Nablus road and the Bet Horon road (along the route of Taha Hussein Street and el-Zaytuna Street, respectively; Kloner 2001: Site 28; ʽAdawi 2012). The proximity of the quarries to these roads facilitated transporting the building stones to Jerusalem and to the nearby settlements. Four quarries (D–A; Figs. 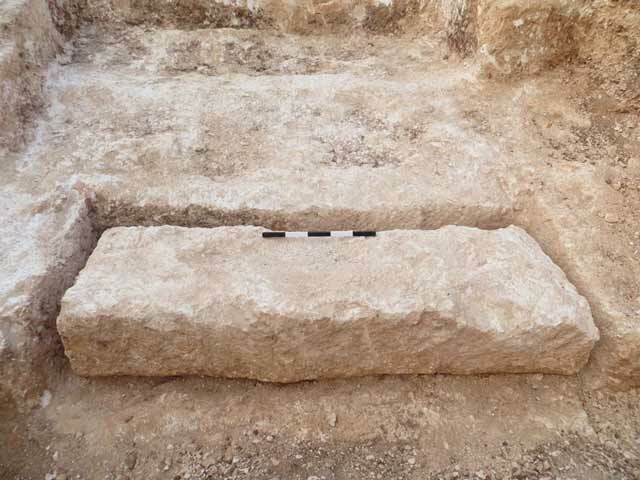 2, 3) and a hewn installation (L18) were excavated. Quarries B and C were the southern continuation of previously excavated quarries (Yeger 2015a). Quarries D–B extended northward, beyond the limits of the excavation area. Mechanical equipment used prior to the excavation revealed the outlines of the quarries, and some of the soil fill was removed down to the bottom of the quarries. Balks (width 1 m) were left at fixed intervals for documenting and sampling the stratified accumulations inside the quarries. The four quarries are a type known as ‘large courtyard quarries’ (Safrai and Sasson 2001:4). The method employed in cutting the stones is known from other quarries in the vicinity: The stones were separated from the bedrock by channels on three sides, and then detached from the fourth, open side. This process can be reconstructed from stones that were left undetached (Fig. 4) and from the negatives of the extracted stones (Fig. 5). The size of the stones in the quarry was rather uniform (most common dimensions: 0.3 × 0.3 × 0.6 m). The severance channels had trapezoidal cross sections (upper width 0.10–0.13 m, lower width 3–4 cm), and their dimensions match the size of the stones extracted from the quarry. Uniform diagonal chisel marks (width 1–2 cm, depth 0.5 cm; Fig. 6) were visible on the walls of the quarries. The finds recovered from within the quarries were meager, consisting of non-diagnostic pottery sherds. Quarry A (L1; length 19 m, width 10 m, max. depth 2.5 m; Figs. 7, 8). Four strata (1–4) were identified in the quarry. 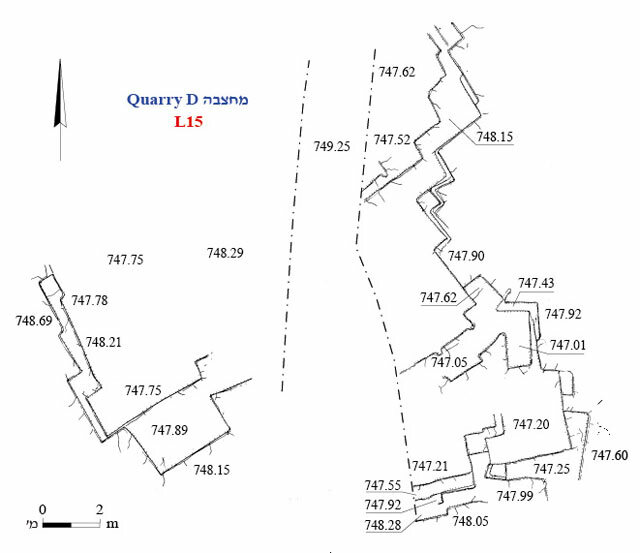 The lowest stratum (1) was a layer of fill comprised of quarrying debris (L5; thickness 0.5–1.0 m), which sloped northward and covered the quarry’s floor. Stratum 2 was loose yellowish red terra rossa (L4; thickness 0.2–0.7 m) that covered the layer of quarrying debris. Leaning against the quarry’s northern wall was a concentration of large fieldstones (L20) that extended down to the floor of the quarry. 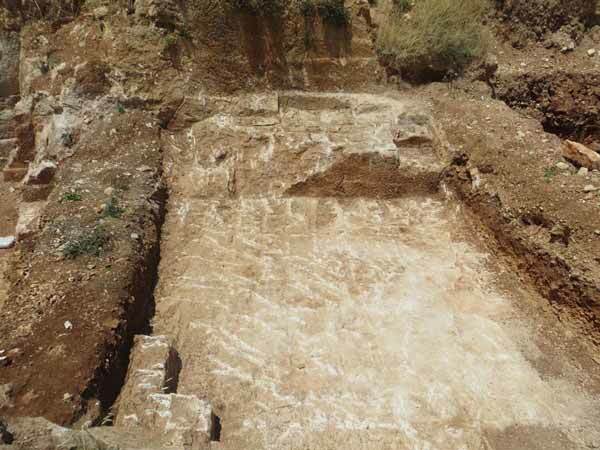 Stratum 3 was loose reddish brown terra rossa (L3; thickness 0.5 m), and Stratum 4, the upper layer, was an accumulation of alluvium (L2; thickness 0.4 m) mixed with debris from the paving of a nearby road. The northern bedrock wall of the quarry was damaged and blasting holes were drilled in it (Fig. 9), presumably the result of quarrying during the twentieth century CE. Quarry B (L6; length 34 m, width 13.5 m, max. depth 3.5 m; Figs. 10, 11). Five strata (1–5) were identified in the quarry. The lowest stratum (1) was a fill of quarrying debris (L10; thickness 0.8 m). Stratum 2 was loose yellowish red terra rossa (L9; thickness 0.3 m). Stratum 3 was a fill comprising quarrying debris and defective quarry stones (L8; thickness 0.8 m). 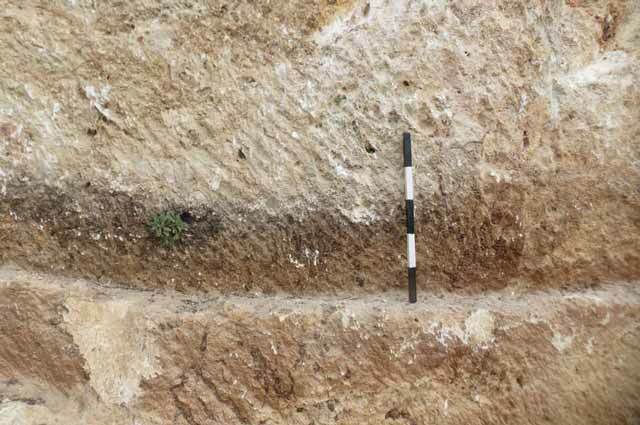 Stratum 4 was loose brown terra rossa (L7; thickness 0.2 m), and Stratum 5, the upper layer, was an accumulation of alluvium mixed with debris (L2; thickness 0.7 m), similar to Stratum 4 in Quarry A. It seems that the quarry was used in three phases. Following the initial phase of quarrying building stones, the installation was abandoned, and its floor was covered with quarrying debris (L10; Stratum 1). This layer was intentionally covered with a fill of terra rossa (Stratum L9; Stratum 2). After a period of unknown duration, the quarrying was resumed and expanded to the west and possibly also to the east. The quarrying debris from the expansion (L8; Stratum 3) was dumped in the center of the quarry, which by that time was no longer in used. The quarry was once again abandoned and covered with terra rossa (L7; Stratum 4). At some point, a square installation coated with gray mortar (L11) was built within this layer. Damage caused to the bedrock and holes drilled in it suggest that quarrying activity took place there during the twentieth century CE, as in Quarry A. Quarry C (L12; length 16 m, width 22 m, max. depth 4 m; Figs. 10, 12). Three strata (1–3) were identified in the quarry. Stratum 1, the lowest, was a layer of fill descending to the north and comprising quarrying debris and defective stones (L14; thickness 1 m; Fig. 13); the two types of debris were alternately piled upon each other. Stratum 2 was loose yellowish light brown terra rossa (L13; thickness 1 m), and Stratum 3, the upper layer, was an accumulation of alluvium mixed with debris (L2; thickness 0.4 m), much like Stratum 4 in Quarry A and Stratum 5 in Quarry B. Quarry D (L15; length 17 m, width 15.5 m, max. depth 1.5 m; Fig. 14). Three strata (1–3) were identified in the quarry. 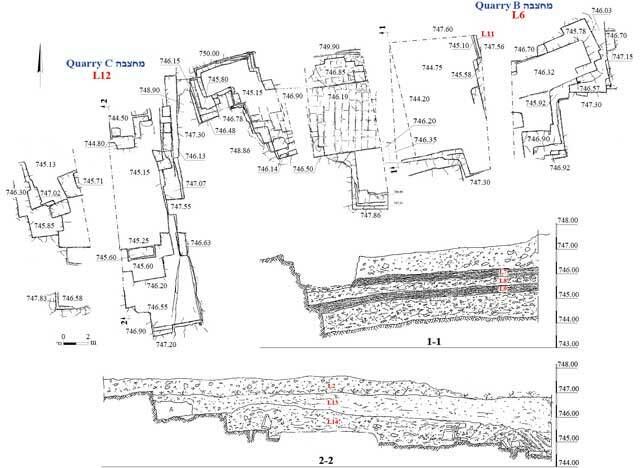 Stratum 1, the lowest layer (thickness 1 m), was a fill consisting of quarrying debris and defective stones. Stratum 2 (thickness 0.5 m) was yellowish light brown terra rossa. Stratum 3 (L2; thickness 0.4 m) was identical to the upper strata in the three other quarries. Installation. An elliptical installation (L18; max. diam. 1.5 m, depth 1 m; Fig. 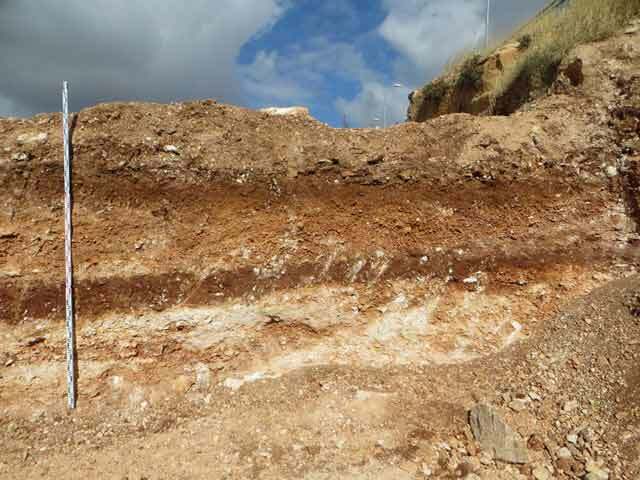 15) containing an accumulation of alluvium was found south of Quarry B. The installation seems to have contained water for cooling the metal tools that utilized in quarrying and dressing stones at the site. Similar installations are known from other quarries found in the vicinity of Jerusalem (Zilberbod and Sasson 2001:145–146). The method of stone production and the plan of the quarries reveal knowledge, advanced planning and organization that allowed for several groups of laborers to work simultaneously. Quarries are difficult to date because quarrying methods did not change much over the centuries (Safrai and Sasson 2001:2). 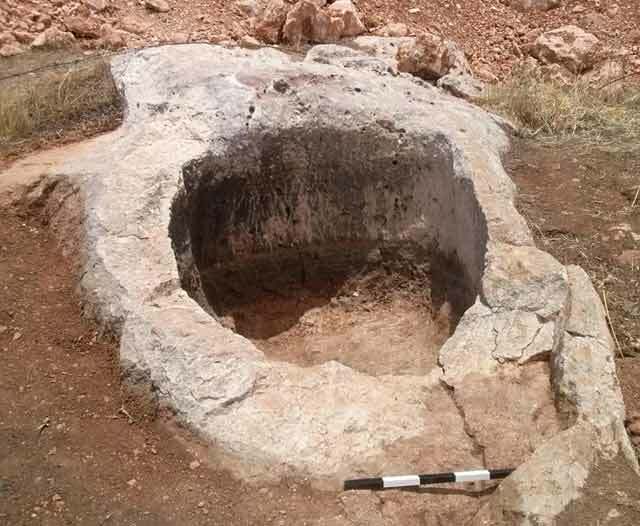 These quarries and those that were excavated and surveyed in the past provided building stones for Jerusalem and possibly also for nearby settlements in the city’s northern hinterland, such as Khirbat Hawanit, Khirbat el-Mughram and Khirbat ʽAddasa (ʽAdawi 2007). Despite the absence of datable finds, we suggest that the quarries date from the Roman–Byzantine periods (third–seventh centuries CE), based on their proximity to sites and similar quarries from these periods. After the quarry was no longer in use, it was filled with quarrying debris and chips from the dressing of stones that were produced during the work at the site. This layer was covered with a fill of terra rosa soil for agricultural purposes. Quarries have characteristics that are ideal for farming: the structure of the quarry’s courtyard provides an excellent water economy for the crops; the layer of terra rossa covering the quarrying debris provided a good foundation for crops; the bedrock surfaces in the surrounding area drained a large amount of runoff into the quarry; the quarry floor is relatively sealed, allowing much of the water to collect there over a long period of time; and the layer of quarrying debris constitutes an aeration layer containing water. This stratification allows the roots to penetrate down to the water, which maintains its high quality due to the aeration system that prevents the roots from decaying (O. Ackerman, pers. comm.). The fill of fieldstones near the northern wall of Quarry A was intended to disrupt the cascade of water running down the slope and allow the rapid penetration of rainwater, thus preventing the cultivation plot from flooding. A similar method was used in the construction of terraces near the foot of the slopes (Gibson 2015:301). The variety of quarrying debris is indicative of several types of quarrying that took place at the site, as suggested by Safrai and Sasson (2001:12): the large, coarse chips can be attributed to quarrying the stones, while the smaller ones are a by-product of secondary stone dressing and the preparation of the stone for transportation. Evidence of a variety of quarrying styles, found alternately one upon the other, indicates that the stone was treated outside the quarry and that the dressing debris was at times removed from the work area and dumped into the quarry. The discarded quarrying debris created a sloping ramp of sorts that was used to enter and exit the quarry. During the excavation, the strata discernable in the balks of Quarries A and B were sampled by a geomorphologist. 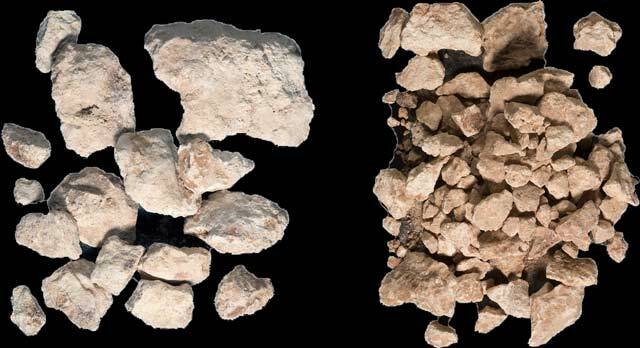 An analysis of the samples will assist in determining when the quarrying work was halted, and when the quarries were filled with soil and adapted for agricultural use. ʽAdawi Z. 2007. Jerusalem, Shikune Nusseiba (A). HA-ESI 119. ʽAdawi Z. 2009. Jerusalem, Shikune Nusseiba (North). HA-ESI 121. ʽAdawi Z. 2012. Jerusalem, Beit Hanina. HA-ESI 124. ʽAdawi Z. 2014. Jerusalem, Shikune Nusseiba. HA-ESI 126. Billig Y. 2016. Jerusalem, Shikune Nusseiba. HA-ESI 128. Gibson S. 2015. The Archaeology of Agricultural Terraces in the Mediterranean Zone of the Southern Levant and the Use of the Optically Stimulated Luminescence Dating Method. Erlanger Geographische Arbeiten Band 42:295–314. Yeger D. 2014a. Jerusalem, Beit Hanina. HA-ESI 126. Yeger D. 2015a. Jerusalem, Shikune Nusseiba. HA-ESI 127. Yeger D. 2015b. Jerusalem, Beit Hanina, Shikune Nusseiba. HA-ESI 127. Zilberbod I. 2017. Jerusalem, Shikune Nusseiba. HA-ESI 129. Zilberbod I. and Sasson A. 2009. 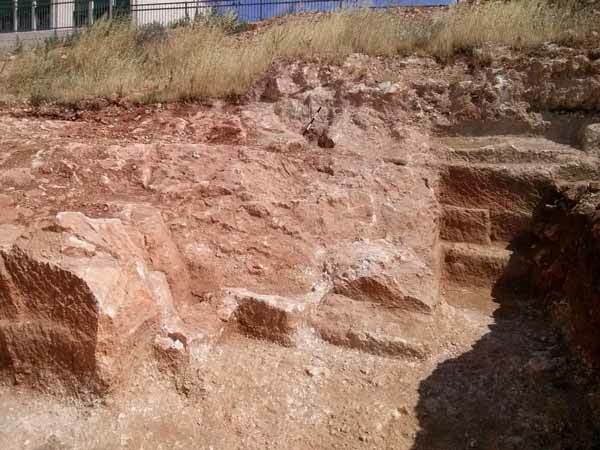 A Building Stone Quarry from the Second Temple Period in Northern Jerusalem. In Y. Eshel ed. Judea and Samaria Research Studies 18. Ariel. Pp. 139–154 (Hebrew). 3. The excavation area, aerial photograph. 4. An undetached stone in Quarry C, looking south. 5. Negatives of detached stones at the bottom of Quarry B, looking north. 6. Chisel marks on the wall of Quarry B, looking north. 7. Quarry A, plan and section. 8. Quarry A, Section 1–1, looking east. 9. Evidence of modern quarrying in Quarry A, looking north. 10. 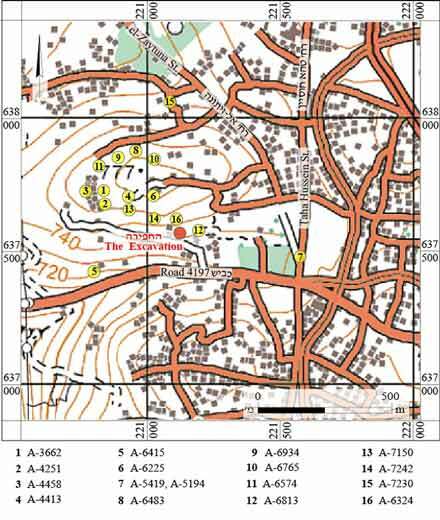 Quarries B and C, plan and sections. 11. Quarry B, Section 2–2, looking west. 12. Quarry C, Section 3–3, looking west. 13. A variety of quarrying chips. 15. A rock-hewn installation, looking north.